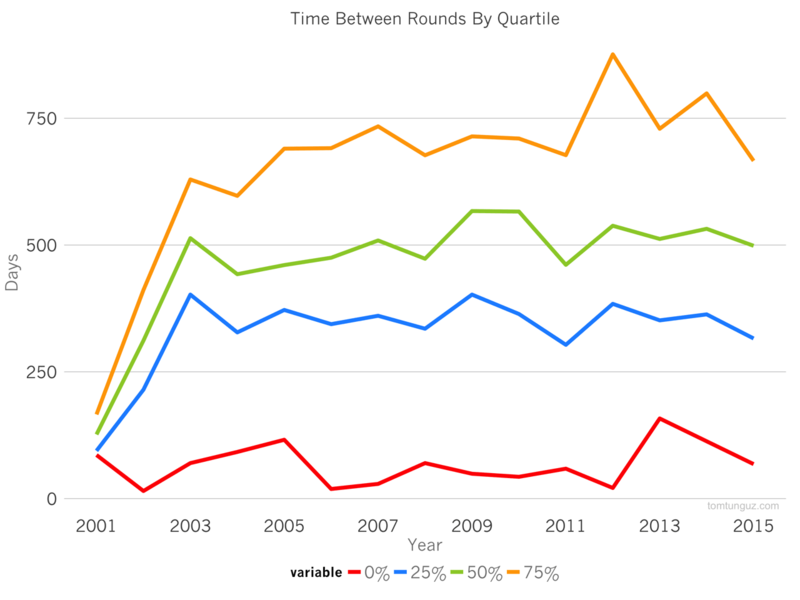 The rate at which startups are raising follow-on rounds is decreasing, and has decreased steadily from 2003 through 2013. 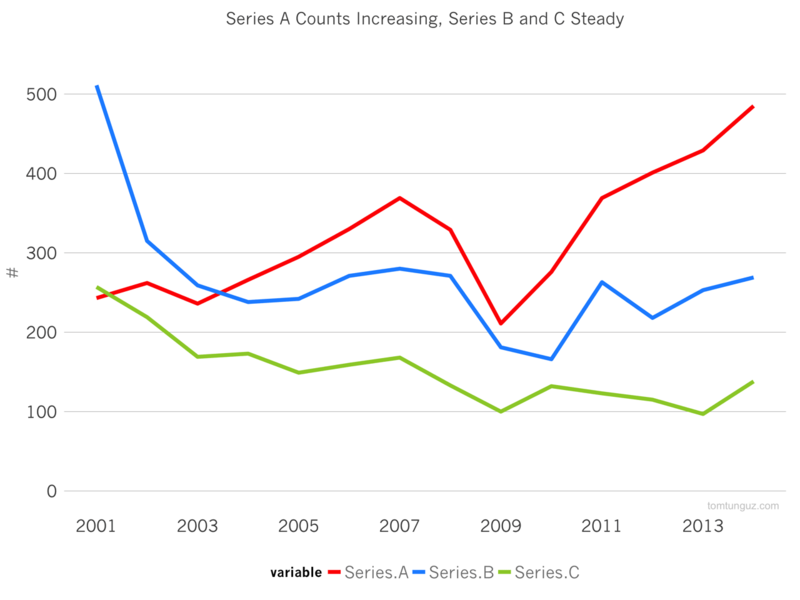 Between 2003 and 2006, post-Series A startups raised series Bs about 57% of the time. However from 2011-2014, that figure fell to 28%. 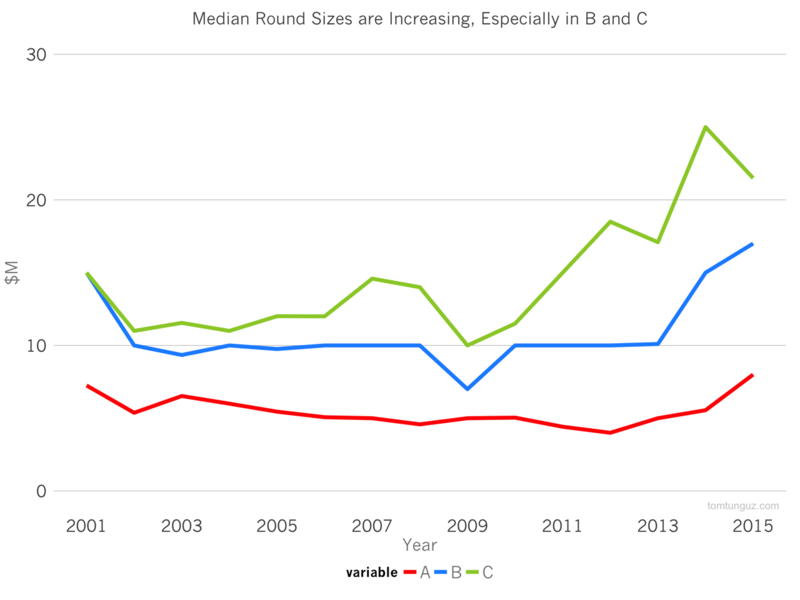 The same trend is true in series C rounds, where success rates fell from 43% to 35%. This decline in startup follow-on fundraising success is the result of an increased number of series A, which have been growing at a rate of 18% per year since 2009. Meanwhile, series Bs and series Cs were steady over the same period. As the number of series As has increased, the sizes of the As have remained constant. In 2014, the median series A was $5.5M, the roughly the same as the average over the past decade. 2015 seems to buck the trend with a median of $8M, but the year is still young, so it’s too early to tell. Meanwhile, series B and C each have doubled since 2009. More and more early-stage companies are raising the $5.5M standard series A. A “fixed” number of startups each year are able to raise follow-on rounds, and when they do, those rounds are twice as big as they were five years ago. This contrasting growth of the series A market and stability in the series B and C market depresses follow-on success rates. Lastly, the decline in follow-on rates does not seem to be tied to longer period between rounds. 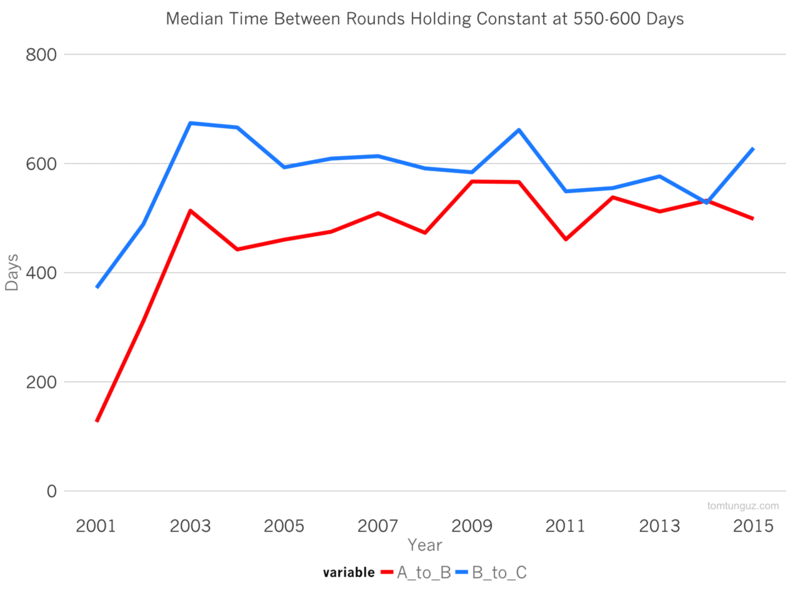 In other words, irrespective of the size of a startup’s financing round, whether in the series A or series B, follow-on rounds are typically raised 500 days after the previous one closes. And this is true for every quartile of company. Meaning, even the fastest rounds today are happening just as fast as they were 10 years ago. The chart above shows the data for follow on rates from series A to series B. Ultimately, this data implies that there is plenty of Series A capital available for startups. And other analysis shows that there is plenty of capital for later stage rounds for startups. However, the fundraising market has a barbell profile, where the amount of capital allocated to series B and series C is relatively fixed. With a greater number of series A companies competing for a finite amount dollars, there is greater competition and consequently, the follow-on success rate has dropped by about half. Notes about the analysis: I used capital IQ data for this analysis. I screened for US venture backed IT and online retailing companies. For most of these analyses, I only look at companies that had raised follow ons. 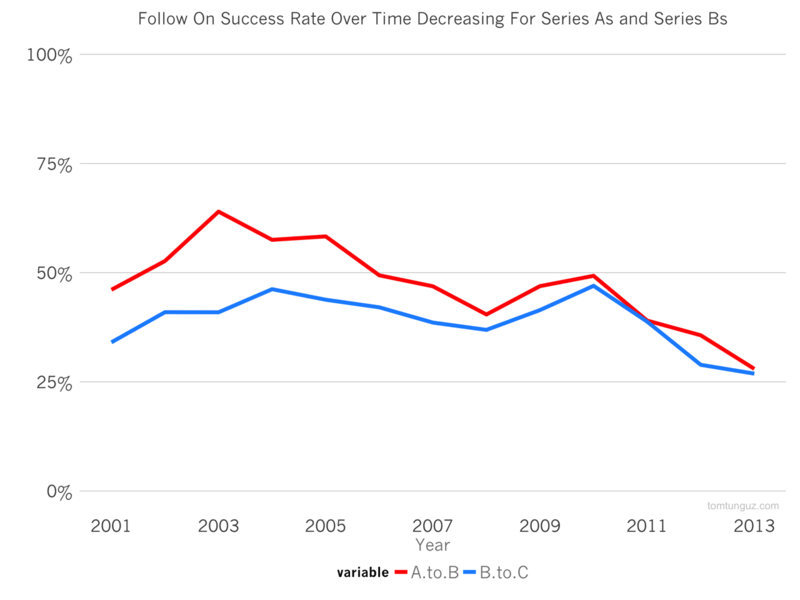 In the “Follow On Success Rate Chart,” the x-axis is the year of the either the series A in the case of series A-to-B conversion, or the Series B in the case of the series B-to-C conversion.